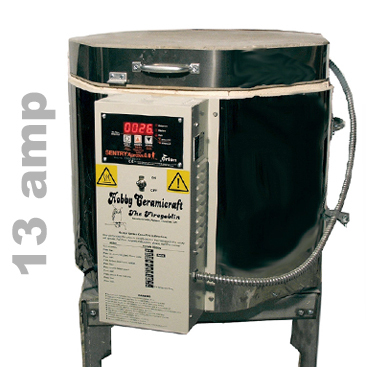 This kiln will run off a 13 amp socket, and comes with a built in computerised 3 key Sentry controller made by Orton Ceramic Foundation, full-formed steel base, and fall-away Prop-R-Vent for easy venting. The hand selected firebrick has dropped, recessed brick grooves which eliminate element pins and offers far more protection to the elements than cheap build kilns where the elements are much more exposed in simple one-cut grooves. The special coating of lid, peepholes and top rim of the firebricks reduces shedding of brick dust, which can cause havoc with your glazed pieces. Other features are cold-rolled stainless steel jacket, a ventilated, louvered switch box , two hand lifts, a super-insulated metal jacket allowing such high temps, heavy duty kiln stand with mar-proof plastic feet and a reversible brick bottom. The FireGoblin is the ideal size for dolls, jewelery, and china, yet still large enough for many small mobile ceramic businesses, and brilliant as a test kiln in any studio. With its 3 inch thick firebrick walls, it can fire up to stoneware, if you are looking to fire this hot on a regular basis, do consider the the Fireluxe with its much higher powered elements. We keep these kilns in stock, usually available for immediate despatch or collection. 12 month warranty on kiln, 24 months on the computer, plus our ongoing help and support as long as you own the kiln! The included furniture kit consists of carefully selected fireclay shelves and posts for this particular model. The furniture allows you to stack multiple layers of ware. Without it, you could fire only the ware that would fit on the kiln bottom. A minimum of 12" of additional clearance is required on all sides of kiln during operation.